Leveraging Brocade VCS™ technology, Brocade VDX 6720 Data Center Switches provide the foundation for Ethernet fabric—revolutionizing the design of Layer 2 networks and enabling cloud-optimized networking. The Brocade FastIron SX Series of switches provides an industry-leading price/performance campus aggregation and core solution that offers a scalable, secure, low-latency, and fault-tolerant IP services infrastructure for 1 and 10 Gigabit Ethernet enterprise deployments. 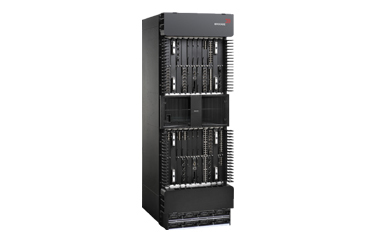 A high-performance, non-blocking architecture and high-availability design throughout with redundant management modules, fans, load-sharing switch fabrics, and power supplies. The Brocade 8000 is a top-of-rack link layer (Layer 2) CEE/FCoE switch with 24 10 Gigabit Ethernet (GbE) ports for LAN connections and eight Fibre Channel ports (with up to 8 Gbps speed) for Fibre Channel SAN connections. This reliable, high-performance switch provides advanced Fibre Channel services, supports Ethernet and CEE capabilities, and is managed by Brocade DCFM. The Brocade BigIron RX Series of switches provides over one billion packet-per-second offerings that scale cost-effectively from the enterprise edge to the core with hardware-based IP routing to 512,000 IP routes per line module. The high-availability design features redundant and hot-pluggable hardware, hitless software upgrades, and graceful BGP and OSPF restart. The Brocade NetIron CES 2000 Series of switches provides IP routing and advanced Carrier Ethernet capabilities, including Provider Backbone Bridging (PBB), in a compact form factor. Based on the feature-rich Brocade Multi-Service IronWare software used on Brocade MLX series, these 10 GbE-capable 1U switches offer deep buffers and are ideal for Carrier Ethernet service delivery at the network edge and for data center top-of-rack server access. The Brocade FastIron GS Series switches provide flexible options with PoE, dual power supplies, and 10 Gigabit Ethernet uplinks. The Brocade FastIron Edge X Series switches are high-performance data center-class switches that provide Gigabit copper and fiber-optic connectivity and 10 Gigabit Ethernet uplinks. Advanced Layer 3 routing capabilities and full IPv6 support are designed for the most demanding environments. Data center and remote office solution that combines best-in-class performance, “pay-as-you-grow” scalability, and flexible deployment options for remote replication, backup, and migration. Up to 16 8 Gbps Fibre Channel ports and six 1 Gigabit Ethernet (GbE) ports provide scalable Fibre Channel, FICON and FCIP bandwidth, port density, and throughput. Entry-level extension switch with two 4 Gbps Fibre Channel ports and two 1 GbE ports provides cost-effective Fibre Channel and FCIP bandwidth for simple point-to-point remote replication. Provides an affordable, flexible foundation for entry-level SANs, and an edge switch for core-to-edge SAN environments. Delivers up to 24 ports of 8 Gbps performance in an energy-efficient, optimized 1U form factor to support the most demanding server and virtual server deployments. Maximum-performance, highest-density 1U building block for enterprise, department, and workgroup SANs. Delivers up to 40 ports of 8 Gbps performance for midrange enterprise SAN switches along with redundant, hot-pluggable components and non-disruptive software upgrades. The Brocade Encryption Switch provides fabric-based encryption to protect valuable digital assets in enterprise data center environments. Offering unparalleled encryption processing at up to 96 Gbit/sec to support heterogeneous enterprise data centers. The Brocade VA-40FC is a high-performance Fibre Channel edge switch optimized for server connectivity in large-scale enterprise SANs.